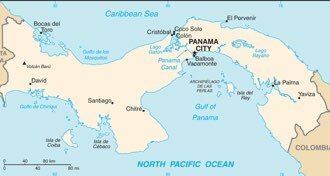 Panama : When and where to go? Panama enjoys a tropical climate, with an average temperature of between 24 and 29 ° C throughout the year, and significant variations depending on the altitude. The year is divided into two seasons: a dry season from January to April, and a rainy season from May to November, where heat and humidity dominate, with showers and daily thunderstorms. The dry season is much more favorable to a discovery of the country, although some events can only be observed during the wet season, such as the migration of humpback whales, leatherback turtles or the presence of quetzal in the forest. The capital, Panama, covers a long strip of the Pacific coast, where you can explore various sites: to the southwest, the old San Felipe district overlooking the sea with its buildings from colonial times to wrought balconies, churches And its museums; The Paseo de la Bavedas, at the very top of the 400-year-old dike; The ruins of the ancient city of Panama built in 1519; The district of via España and its skyscrapers, contrasting violently with the aforementioned places: the botanical garden; The national park of Sobrerania with its virgin forest which extends over almost 300 hectares. The channel: reputed for its technical ingenuity, it measures 80 km and flows in the middle of the rainforest. Thousands of boats sail there and visitors who want to know more can go by boat to the Miraflores Lock to visit the museum with its models and watch a film about the canal. The San Blas Archipelago: it is made up of almost 400 islands, which enclose the Caribbean coast, and this autonomous province is administered by the Kuna Indians, who have kept their language and traditions. It is the ideal place to practice diving. Boquete: it is a small town, located at 1600 meters of altitude, known for the mildness of its climate and for its very preserved environment, in the province of Chiriqui. Set in the heart of a steep valley, it is surrounded by coffee plantations, such as the famous Arabica, and tropical birds, including quetzal, especially in April and May. From Boquete, you can also climb the volcano Baru or simply discover the national park around this volcano. The island of Taboga: it is in the south of Panama, about twenty kilometers and offers to the visitor its preserved virgin forests and a very beautiful beach. It also has a very impressive colony of pelicans and it emits floral scents that gave it its nickname of "the island of flowers". There is a 16th century church. EU citizens do not need a visa but a valid passport if their stay is less than 3 months. The current currency is the balboa (PAB). The easiest way to get to Panama by plane is to stop in Miami. To travel within the country, you can also take the air way, which has a good internal network, but also buses, which are inexpensive. You can also rent a car, but the road network is undergoing renovation, so caution is required. In the archipelagos, boats are obviously the only means of transport possible. Budget: you can plan a small budget for your stay in Panama, even if the accommodation is a bit more expensive than in other countries of Central America. A room in an average hotel will cost you about € 30, and a meal under € 10 in a decent restaurant. You can however find dishes on the markets for less than 2 €. Health: Prefer bottled water and protect yourself against mosquitoes, which transmit dengue. Conventional vaccinations are needed, but you should add those for typhoid and hepatitis A and B, as well as treatment for malaria. Security: Be vigilant in the old city of Panama, especially if you are moving at night, and avoid hot spots. Avoid the town of Colon, which is dangerous and offers little interest anyway. It is highly unwise to visit the province of Darién, as well as in the most eastern part of the San Blas. Shopping: you can bring back baskets and other baskets, various wooden handicrafts, traditional "mola" fabrics of all colors that are embroidered by Guna or Kuna women, and of course the famous Panama, without To forget the coffee, of which one can find three different kinds.